America’s oil and gas rush is depleting water supplies in the driest and most drought-prone areas of the country, from Texas to California, new research has found. 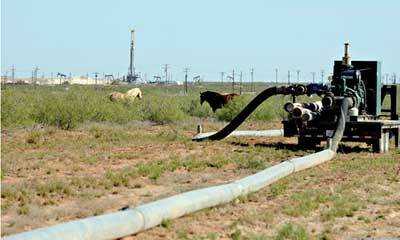 Fracking those wells used 97bn gallons of water, raising new concerns about unforeseen costs of America’s energy rush. Without new tougher regulations on water use, she warned industry could be on a “collision course” with other water users. 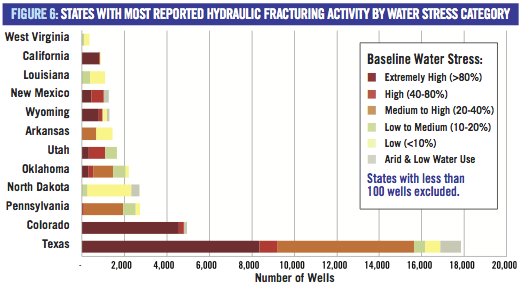 It can take millions of gallons of fresh water to frack a single well, and much of the drilling is tightly concentrated in areas where water is in chronically short supply, or where there have been multi-year droughts. Half of the 97bn gallons of water was used to frack wells in Texas, which has experienced severe drought for years – and where production is expected to double over the next five years. Farming and cities are still the biggest users of water, the report found. But it warned the added demand for fracking in the Eagle Ford, at the heart of the Texas oil and gas rush, was hitting small, rural communities hard. Local aquifer levels in the Eagle Ford formation have dropped by up to 300ft over the last few years. A number of small communities in Texas oil and gas country have already run out of water or are in danger of running out of water in days, pushed to the brink by a combination of drought and high demand for water for fracking. Twenty-nine communities across Texas could run out of water in 90 days, according to the Texas commission on environmental quality. Many reservoirs in west Texas are at only 25% capacity. Nearly all of the wells in Colorado (97%) were located in areas where most of the ground and surface water is already stretched between farming and cities, the report said. It said water demand for fracking in the state was expected to double to 6bn gallons by 2015 – or about twice as much as the entire city of Boulder uses in a year. In California, where a drought emergency was declared last month, 96% of new oil and gas wells were located in areas where there was already fierce competition for water. The pattern holds for other regions caught up in the oil and gas rush. Most of the wells in New Mexico, Utah and Wyoming were also located in areas of high water stress, the report said. Some oil and gas producers were beginning to recycle water, especially in the Marcellus shale in Pennsylvania, the report said. But it said those savings were too little to offset the huge demand for water for fracking in the coming years. Previous PostU.S. Reforming “Outdated” Overseas Food AidNext PostKhaya Dlanga: Is a post-racial South Africa possible?